Tag line: "Two tiny agents vs. the world's wickedest woman in a dazzling animated adventure!" 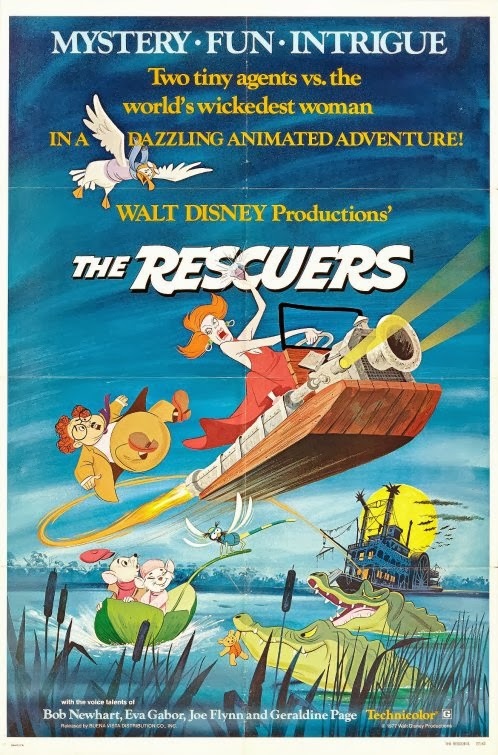 1977’s The Rescuers was the first Disney animated film I ever saw on the big screen, and for a 7-year-old kid, it was a pretty exciting experience! The Rescue Aid Society, an association comprised of mice from all around the world, has received a mysterious plea for help from a young girl named Penny (Michelle Stacy). The mission is assigned to Miss Bianca (Eva Gabor), who surprisingly requests that Bernard (Bob Newhart), the society’s janitor, accompany her on this dangerous quest. After a brief investigation, Bianca and Bernard determine that Penny was abducted by Madame Medusa (Geraldine Page) and shuttled off to the swamps of Devil’s Bayou, where, under the watchful eye of Medusa’s bumbling accomplice, Snoops (Joe Flynn), the young girl is forced to explore a series of caves, all in the hopes of finding the Devil’s Eye, an enormous diamond left behind by pirates many years ago. Hitching a ride with Orville (Jim Jordan), a wayward albatross, Bianca and Bernard make their way to Devil’s Bayou, where they’ll have to contend with Medusa’s “pets”, a pair of alligators named Nero and Brutus, if they’re to have any chance at all of rescuing Penny. Aside from its soundtrack, which has a decidedly ‘70s vibe (“Someone’s Waiting for You”, performed by Shelby Flint, was nominated for an Academy Award for Best Song), The Rescuers has aged fairly well. Newhart and Gabor do a fine job as the two heroes, and have a natural chemistry together, but the real standout is Geraldine Page’s Madame Medusa, a greedy tyrant who holds Penny’s beloved teddy bear hostage until the girl can locate the Devil’s Eye. While not as menacing as other Disney villainesses (Cruella De Vil from 101 Dalmatians is much more sinister), Medusa is, at times, quite frightening (especially when firing her shotgun, which she seldom bothers to aim). Filled with interesting characters and memorable scenes (the most nerve-wracking of which is when Bianca and Bernard accompany Penny down into the cave to search for the Devil’s Eye), The Rescuers, while undeniably one of Disney’s “minor” animated works, will forever hold a special place in my heart. No... no Fievel in this movie. That was AN AMERICAN TAIL from 1985.